So this is the new Democracy in America? As a Democrat politician, if you don’t like a piece of legislation, just hide from the police until they drag you kicking and screaming to cast your vote. Democrats, who are owned by the Unions, decided not to show up to a vote that would limit Union power so as not to upset their owners. This is illegal, so the police are out looking for them. This is what happened today in the news. This cycle has repeated so much that Government Union workers are now the wealthy Elite Class of U.S. citizens, we are paying billions of dollars in taxes to pay for their lavish benefits and states all over the country are going bankrupt from it. The Government Employee Elite Class now make more money than us, retire at 55 with 90% of their salary as a pension payment for the rest of their lives and when they die that payment continues to their spouse until they die. They pay little or nothing into their health care plan which is for their entire lifetime. They pay much less, if anything, into their pension plan. Their pension plan is guaranteed which means no matter how bad the market is (think about your 401k) they get a fixed payout. That means any loss to their retirement funds from a bad economy is back-filled by raising your taxes to pay for the losses. Does anyone, anywhere in the private sector that is not a top-level executive have anything even close to that in benefits? Not a chance! When did “government service” that was supposed to be an honorable job because everyone knew it didn’t pay well but you were working for your fellow citizen, become such a lucrative and well-benefited and over-paid position? When the Democrats decided to make it that way, that’s when. The Democrats started paying-off this large labor force in order to secure their votes, forever. That’s all this is, a bribe paid for with your tax money by the Democrats to the Labor Unions in exchange for votes and campaign support. Have you ever seen bus loads of Union workers turnout at a voting booth or in front of the cameras for a conservative? I never have. It is always for Democrats, so you have to ask yourself why that is? And I’m telling you why. So many states are so broke because so much of their income (your taxes) is diverted to paying for these pension and health care plans and other benefits that they are passing laws to break the Unions stranglehold on negotiating for more benefits. When Wisconsin joined other states in breaking the Unions back, the Democrats decided not to show up and hide like rats in the dark to avoid upsetting their Union handlers who expect them, and have paid for them, to represent them. 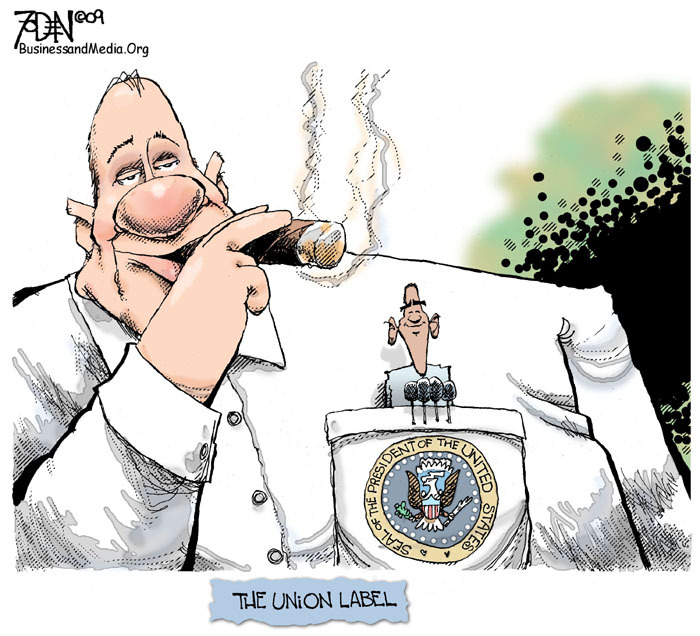 The Democrats are owned and managed by the Government Unions. Their sole purpose is to take, by force, as much money from you as possible and divert that to an ever growing raft of government union employee benefits.